Haha okay okay, so that might not happen (I enjoy daydreaming) BUT here are some tips that will hopefully help your class with the transition back into the school routines you worked so hard to establish in the beginning of the year. Do you get attacked with tattles each day? Do you go to pick up your students from recess with an optimistic smile on your face only to be attacked with, "HE SAID HE'S NOT MY FRIEND!" and "SHE WOULDN'T SHARE THE BALL!" Do you have - *gasp* - little hands actually grabbing at your shirt to tell you such horrible playground atrocities have occurred such as, "Lily wouldn't get off the swings and I never got a turn!" and "He cut me in line!" Oh, the horror. Ask most elementary teachers and they will tell you that tattling is an issue in their classroom. Thankfully, there are a lot of ways to curb tattling in your classroom while still meeting the emotional needs of your students. So little Alex is aggravated and says, "Jimmy keeps looking at me!" 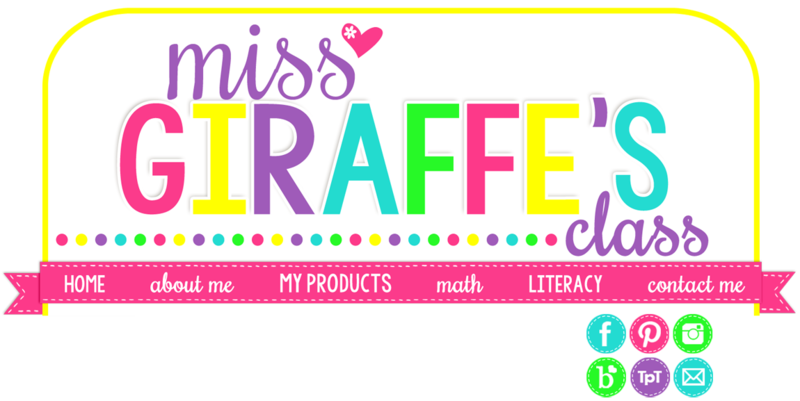 You could be Miss Sassypants Teacher and say, "Well how do you know he's looking at you if you're not looking at him??" Plus, it won't stop Alex from being upset. It won't stop Alex from tattling the next time he's upset. It won't stop Jimmy from looking at Alex. It'll just show Alex that you don't care which will make him even more upset. Even worse, Jimmy might have heard the whole thing and be a bigger instigator because now he knows he can get away with making Alex upset and you won't do anything about it. 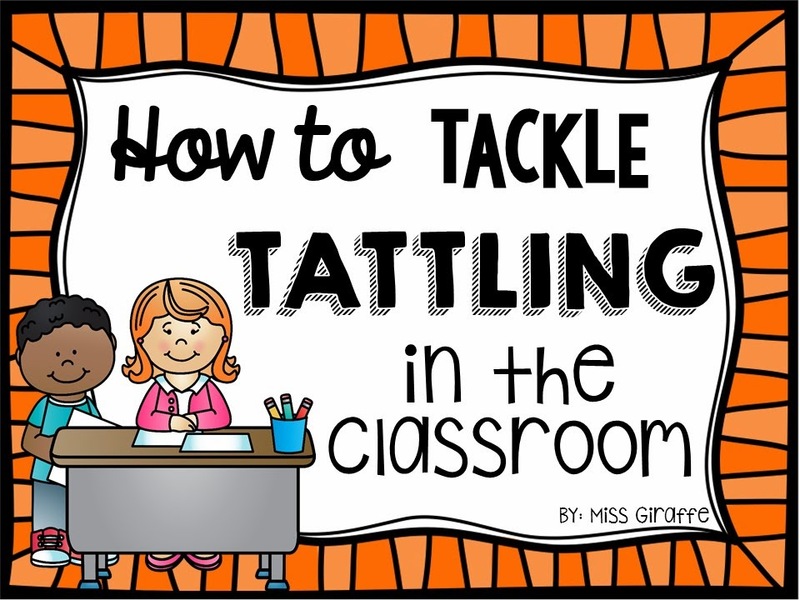 Instead, you can teach your students to know the difference between TATTLING and REPORTING (as well as talking their problems out with one another which I'll talk about later). A TATTLE is when you're upset at someone and are trying to get them into trouble. A REPORT is when someone is hurting or may be hurt and you're trying to help them a.k.a. get them out of trouble. If you teach your students the difference between these two, you'll drastically cut down on the meaningless tattles while still getting important information as it arises. You want students to know that they can come to you if they really need help and, most importantly, that you care. But you also want to teach them how to handle problems on their own. Problem solving is a crucial life skill that they will carry with them forever that will make their lives (and your life) so much easier. The easiest way to teach the difference is ROLE PLAYING. I love role playing! You can show them how silly they look when they tattle and they'll think it is hilarious. Gather your students on the carpet. Let a student play the teacher and you play the student so you can really drama it up. Have the "teacher" just stand there while you run up and say, "(Totally out of breath like it's a huge deal) Miss GGGG! Miss GGGG! Olivia took my peeeenciiiillll and she won't give it backkkk" in your whiniest little kid voice. Ask them if you're tattling or reporting. Then, come up and say, "Miss G! Sam fell on the playground and his leg is bleeding! He's laying down crying over there!" Ask them if it's tattling or reporting. Explain to them the difference here is that they were trying to get someone out of trouble rather than IN trouble. Act out several scenarios until they really start to get it which will happen pretty quickly. Let the teacher change a few times but keep playing the student of course. They'll think it's really funny and it'll show them how ridiculous some tattles are and how/why reporting is different. After you do the activity on the carpet, do a Tattling vs. Reporting cut and paste sort to solidify the concept and check for understanding. You can either do the text only version or the picture enhanced version for more support. 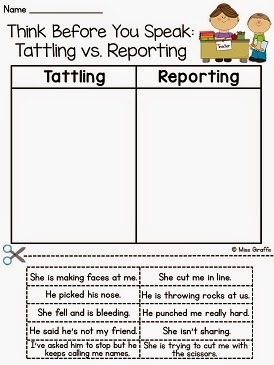 These sorts are great for helping students differentiate between tattling and reporting. I recommend pulling them out again for review any time in the year if tattling issues begin to resurface. You could even laminate them and put velcro on them to have out in your "calm down" area of your room for a reminder. You've probably also gone over good choices vs. bad choices a million and one times but I really don't think there's anything wrong with a million and two. 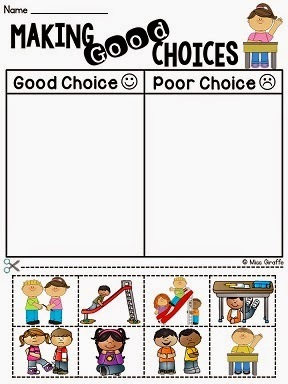 Young kids need a lot of reminders and I think visuals can be really helpful so I made picture versions of my Good vs. Bad Choices sorts. And there's a text only version too of course! After you feel like they understand the difference between tattling and reporting, work on problem solving with them. Bring them back to the carpet for some more role playing. I'm telling you, it works! Channel your inner Julia Roberts (or whoever! I prefer to pretend that I'm Jennifer Aniston) and play the role of the upset student. Have another student be the offender (they'll LOVE getting to play the "bad guy"). Have them pretend to do something undesirable to you (take the pencil you're using, not let you swing on the swings, stick their tongue out, whatever!) and practice how you should and shouldn't handle the situation. -You: You're mean! I'm telling Miss G! Ask them if this is the right way to handle the situation. You'll hear a resounding noooo. - You: It hurts my feelings when you do that. Could you please stop? Give them the right sentence starters to express their feelings to one another. "It hurts my feelings when you.." "Can you please..." "Will you please..." etc. Also teach how to offer a compromise. Someone may not want to get off the swings or are currently using the red crayon. 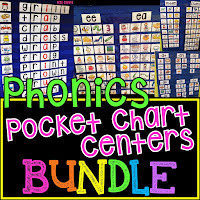 Teach them how to say, "Can I use the red crayon after you?" or "Can I get on the swings after you?" and also how to be kind in responding to such requests. If you see someone is waiting for the swings, swing for a little bit and then let them have it. Use a different crayon color. Teaching kindness is just as important. After you act out several scenarios, have them practice with the person next to them. Kids love acting and will be really engaged. Make sure you also explain that they need to say it nicely and be sincere if they want the person to respond nicely. If you say, "Can you please stop?!" rudely, that's not the same thing. Being nice will usually get niceness in return, rudeness will usually get rudeness in return but they need to always be nice even if the person is being rude to them. Also, if and only if, they try multiple times to ask someone to stop and they don't, it becomes a report. When they just absolutely oh-my-goodness it-can't-wait must-tell-you-now tattle, have a system for that. There are a lot of great options! - A Tattle Box: Have a little box with a slit in it (so that students can't get into them without causing a scene) that students can write down "tattles" to tell you. A box of tissues is perfectly sized and has a slit already in the top which makes it easy. You could cut a hole in the top of a shoe box or other box as well. Another fun option are those little trash cans with the push opening that you can usually find at dollar stores. Students write down the tattle AND how they tried to fix it and put it in the box. For example, they have to write, "I asked Molly to stop but she keeps making fun of me." Sometimes they just want to get it off their chest and feel listened to so just writing it down and knowing you'll read it later is enough for them to feel a lot better about the situation. It's also a great insight into what goes on "behind the scenes" with your students in their little world. You may notice a lot of tattles about Ava being mean to others when she's perfectly behaved in class. Many kids are great chameleons where they can be manipulative bullies on the playground and the most helpful charming seeming child in class. 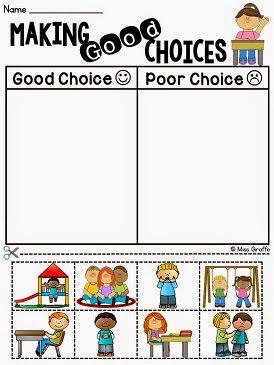 This little box of communication can be a great peek into your kids' perceptions. Make sure they know you will read them when you get a chance. You don't have to read them every day, just whenever you get a chance. You can just put little paper strips from scratch paper at the box that students can come to after they've finished any work they should be doing. - A Tattle Phone: Use an old phone students can talk into in a corner somewhere private to vent their frustrations. You won't get to (or should I say have to?) hear them and they get all their thoughts off their chest. - A Tattle Buddy: A stuffed animal they can tell their tattles to, much like the tattle phone. This also works for feelings. It can be great for a calm down area of your room where students can feel heard and loved by their stuffed animal friend as they express themselves. - A Sticky Note: Have a little pad of sticky notes they can write their tattles/thoughts down on and then just place on your desk. Be careful of this though - you might end up with a million "I <3 you" sticky notes on your desk if you don't explain how they are only to relay important messages. The best thing about these tattle options is that they don't stop you from teaching or doing what you're doing. Tattles usually come at the most inopportune times when you don't have time to handle a problem so these are all options where it's not omgthisjusthappenedrightnowpleasefixit urgent. This leads into one of my favorite classroom management techniques ever - the community circle. You can call it whatever you want. Think of a clever name if you must. 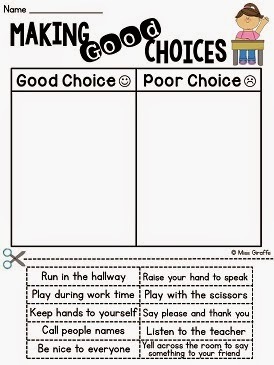 It's a GREAT end of the week (or end of the day if you need it) activity that adds a lot of love and positivity to your classroom and your kids will love it. Anyway! Once they're all sitting in a circle/rectangle/whatever, have them all put their legs straight out in front of them. YOU are also in the circle.. or at least the first couple of times. You can sit on the floor with them or sit in a chair so you have a better view of what is going on and not on sneeze level. Grab a stuffed animal and tell them that you can only talk if you're holding the stuffed animal. This is a firm rule. You can use this time to say what went well in the day, what you'd like to be better for tomorrow/next week, etc. before you start the complimenting activity. The way it goes is - When you have the stuffed animal, you pick someone in the circle with their legs out to give a compliment to. You should start to model it. For example, Jill's legs are out, so I might say, "Jill - I love the way you worked so hard during centers and helped your friends when they needed it. Thank you!" and Jill will say, "You're welcome" and put her legs criss cross applesauce to show that she has already received a compliment. Her legs will stay criss cross. My legs stay out and I will pass the stuffed animal to whoever is on my right. That person will choose someone with their legs out to give a compliment to. The complimented person will pull their legs in criss cross. The complimenter keeps their legs out because they gave a compliment, not received one, and pass the stuffed animal. The stuffed animal goes around the circle like this until it get backs to me. By this time, everyone has both given and received a compliment and all legs should be criss crossed. The trick is that you can only compliment someone who has their legs out which ensures that everyone will receive one compliment. It is AWESOME to hear their compliments for one another - things you didn't realize happened on the playground or at specials or lunch. It really fosters a great sense of community and you can really feel the love. After you do one or two, you'll really start to notice your kids doing nice things for one another a lot more. I can't say enough great things about it! It's such a great feel good activity. If you have chronic tattlers, try to find out why. *Do they feel like an outcast, like they're always being picked on? If this is the case, help them connect with one of your sweetest kids. Let them be math partners or sit next to them. Sneakily put them next to each other in the lunch line so they eat lunch together. Give them a task to do together to help. Sometimes just knowing they have one good friend they can rely on that cares about them is what they were craving. *Do they feel the need to control everything around them because they feel so helpless in their home lives? I call these kids "classroom cops" because they walk around constantly policing the other students. They need to feel in control of something and that's a valid need. Give them an important classroom job (or two), especially one with authority like managing the lunch cards or the clean up supervisor. That way, they can channel all of that need to control into their job. *Are they extremely good do-right-always kids and can't imagine how anyone else could possibly misbehave? These are the easiest kids to deal with because you just need to explain to them that they only need to worry about themselves doing the right thing. Knowing that tattling is against the rules because of your tattling vs. reporting lesson is often enough to deter these little tattlers. If it's not, have a quick little sit down with them to explain that. *Do they just desperately want your attention? Let them write the tattles to you. Or, better yet, start a journal with them. Be discreet and whisper about your private journal with them so they think it's your little secret and feel special. They can write things to you - anything! And trust me, they'll come up with things to say. Write them back just a few quick sentences whenever you get a chance. Ask how their day is going or what they like to do at recess. Of course make sure they know that you might not write back for a day or two because you're extremely busy teaching but that you will write back when you can. 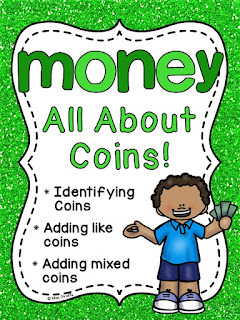 Have them simply put it in your "inbox" (where students turn in papers) when they want you to read it and keep it in their backpacks any other time. If and when they run out of things to say... GREAT! But it's always there when they feel like they want to talk to you and are craving that attention. This way, it'll come out in a positive easy-to-manage way and their needs are still being met. It's honestly a great thing to do with any student though - it's great writing practice, it builds such a strong rapport with them, and it really gives you a look into what's going on in your classroom that you might not see. You may not know little Susie feels like she has no one to play with at recess or that all the kids got into trouble at daycare yesterday and that's why everyone's acting a little wacky today. In summation (look at my college skills, ha), tattling can be a difficult thing to deal with but it can easily be fixed. Students need to know that you care but also need to learn how to handle problems themselves, be taught kindness, and understand the reasons behind their actions. I truly feel like tattling can be eradicated almost completely, or at least made much more manageable, if you follow through with some of these tips! 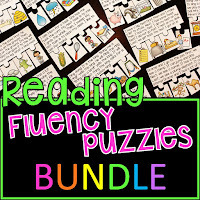 I really hope this post was helpful to you and you were able to find some good information that will help you in the new year with your students! Have a wonderful return back to school, friends!! 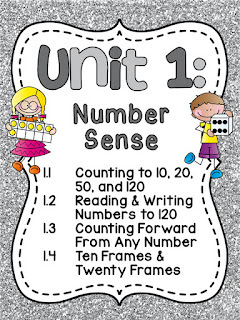 If you loved this, you may also like my 25 Easy Tips to Get a Talkative Class Under Control and 20 Classroom Management Strategies You Can Start Right Away posts too! Here's a picture you can pin if you want to save this for later! 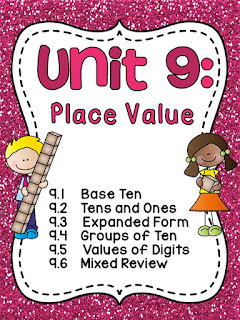 I am currently student teaching, and this was very helpful. I am still trying to learn the best method of managing the class, and tattling has been wearing me down a bit. Thanks! Love this! Very helpful post. I absolutely love this! I'm going into my first year of teaching, and I will definitely strive to implement some (most) of these. Thank you! Thank you for this! A great article with lots of amazing suggestions.